I was surprised, but not unpleasantly so, to see that all the dessert category finalists in the Cooking Light Ultimate Cook-Off were cookies. There was a Mexican Shortbread, a Caramel Apple Oatmeal, and Heart Smart Chocolate Cherry Cookies, which won. I had all the ingredients on hand, so I made a quick half-batch yesterday to share with my friend Jennie. Upon taking them out of the oven, I decided not to share them with Jennie because I thought they might taste too healthy. Plus, they needed some time to set, since they were kind of gooey and warm – the chocolate chunks melted into the cookie. After they’d set, they were pretty good and I wished I had shared them. Then again, I should probably wait until I have actual cherries since that’s what the winning recipe calls for and the winner used gourmet dried cherries from Maine. I had to make mine with dried cranberries. Either way, they were a good cookie with some nutrients here and there. 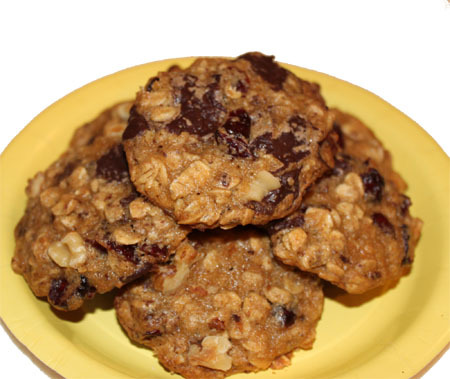 The winning Heart Smart Chocolate Cherry Cookie recipe is on Myrecipes.com and it does not call for walnuts. I couldn’t make a heart smart cookie without walnuts, so I added them. I also reduced the batch to half, so it you don’t need tons of cookies around, you might find the modified directions useful. Preheat oven to 350°. Combine flours, oats, baking soda and salt in a bowl and mix well. Microwave the butter for about a minute (or until melted) in a large microwave-safe liquid measuring cup. Stir the sugar into the butter and let cool for about 5 minutes. Add sugar mixture and vanilla to flour mixture and stir one or two strokes; add egg and stir until blended. Stir in cherries and nuts. Make sure batter isn’t too warm, then stir in chocolate. Drop dough by tablespoonfuls 2 inches apart onto a parchment lined cookie sheet. Bake at 350° for 12 minutes. Cool on pan 3 minutes or until almost firm. Remove cookies from pans; cool on wire racks. I tried this recipe and it’s very good. I agree with Shannon’s boyfriend, but this cookie taste every bit as good as a regular cookie. BTW, my boyfriend is not overweight, nor a jerk, but he feels that if you’re gonna eat a cookie, you might as well just indulge and go for the full-fat version. I agree sometimes, but also like to cut some calories and increase nutrients where I can. If you didn’t already know these were “light”, do you think most peole could tell just by tasting them? I love the extra chew-chew-chewiness dried cherries give to cookies, almost like a gummy bear sans artificial-ness. 🙂 Actually, I love them more than raisins in my cookies! I read this recipe yesterday at work and thought about baking them! Seriously. They sound good and I love the name. I am surprised there aren’t nuts in them though. I wonder if this one won the category? I can’t remember. Anyway. They look great. Looks and sounds like a great cookie! I think the only difference between dried cherries and cranberries is cherries are a little sweeter and a tad larger. I like them both. Think I will use pecans when try this….always think walnuts are bitter. I just made a pretty healthy almost-vegan cookie last night that I’m trying to get posted. Used spelt flour and Stevia in the raw. They are really good. These look good! Oatmeal cookies were on my list to cookies to make with the Stevia. It was not a noticeable aftertaste really at all. But I made the cookies a second time and used turbinado sugar instead of the Stevia and I liked those better. Hmmm? I’m out of dried fruit (I know, chocolate chips would work great! ), and we’re a little snowed in again today. Well, I have dried pineapple.